Encounter: Caribbean reef sharks and Blacknose sharks (Carcharias acronotus). This is an organized shark feed where the Blacknose sharks generally arrive first and hang around until the Caribbean reef sharks take over. The feeder wears chainmail sleeves and the divers arrange themselves in a line 'Bahamas style' kneeling on the sand. The individual reef sharks are usually repeat visitors that are well known to the feeders. Consequently they are very bold - pushing between the feeders legs to get at the bait. The Blacknose sharks are harder to approach but if no Caribbean Reef sharks show up then they become much bolder and can become erratic and hard to control. Operators: Whitney and Bobby Keogh of Dive Safaris started the feed some years ago and they remain the only dive company that regularly organize feeds. 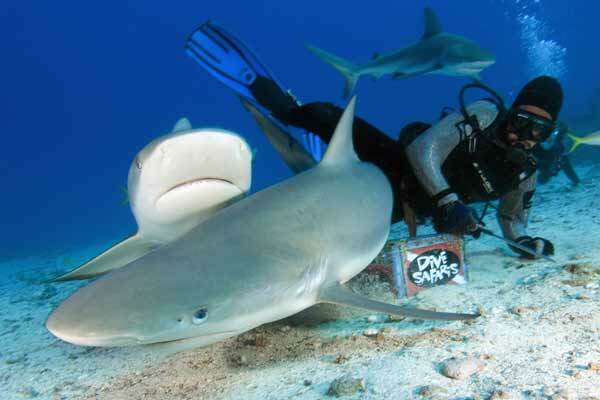 Their feeders are well trained and the 'shark awareness dive' starts with a thorough explanation of the sharks behavior and incorporates useful advice and information on the need for shark protection.. Directions and Accomodation: Dive Safaris has two stores on either side of the Dutch part of the island. The shark dive leaves from Bobby's marina in Philipsburg where a variety of quaint hotels and guest houses are available. Most travelers arrive on package charters which is probably the best option financially. Many of the shark divers arrive on cruise ships just for the day and the ships that stop at St Maarten offer the shark dive as one of their excursions.